You might occasionally come across this dish by another name…..’The Turkish’….and it is a common dish around Camden Town in London. These are flatbreads spread with (usually) a raw spiced lamb mince mix (I occasionally use beef which works just aswell) then baked rapidly in a firey oven. They are typical street food fare and are best eaten straight from the fire and sometimes rolled into a cigar before being smothered with a garlic yogurt and devoured! Word of warning, if you intend to make this and eat it on the go…it is very messy…….nothin’ wrong with that!! Start by getting the flat bread ready, this is pretty similar to pizza base making. Combine the flour, water, salt and yeast in a big bowl and bring together with a fork then your fingers to create a dough. Turn out onto a floured board and knead for a minimum of 15 minutes. Form the dough into a ball then back into the mixing bowl, cover with a damp cloth and leave to rise for about 90 minutes. When the dough has at least doubled in size, knock it back, turn it out onto the board again and divide into two equal size pieces. With your fingers and hands pull and stretch the dough into long oval shapes (see the pic above) you can use a pin to roll down to about 1/2 cms thick. Then set on a large baking tray under a cloth. Next get the spiced lamb together, add the mince to a bowl and add in the cumin, garlic, salt, chili, puree and sumac and mix very, very well. At this stage I like to really get the lamb pasted so I run it through a blitzer to get it super fine. You can now adjust the seasoning, simply pinch off a piece and fry it to gauge seasoning, spice and heat – if you are happy then we can begin! Simply spread a thin layer of the mix across the flatbread to the very edge (it will pull back during cooking) then sling into a full tilt oven…220c if you can get it, bake for about 8-10 minutes. 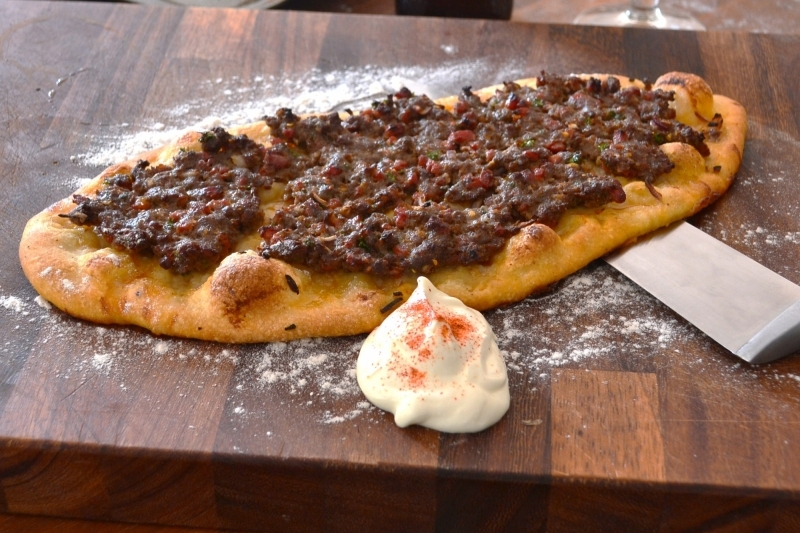 The flatbread will bubble and rise, this is what you want and also do not be afraid of a little charing! Brilliant ! I love those breads!!! And your recipe reads real well.. Jolly well done.. Have some minced pork needs cooking.. I know it’s not quite right yet gonna try it on the Turkish! Sweet! That’s how to roll Fitzy – do what you feel 🙂 Let iz know how it turns out fella!! Nice! M&S have a lovely lamb flatbread at the moment and this looks similar. Must give it a try. Very elegant Rory. I could scoff one or two of those along with a few beers. Delicious. Cheers Conor – very scoffable with beer but friggin’ problem is their eatability..2 is never enough! !